The 'Historia von der Auferstehung' by Heinrich Schütz is a perfect example how lithurgical drama, a very prominent part of counter-reformation propaganda in Italy, found it's way to Germany and was transformed into a devotional entertainment at the protestant court in Dresden. 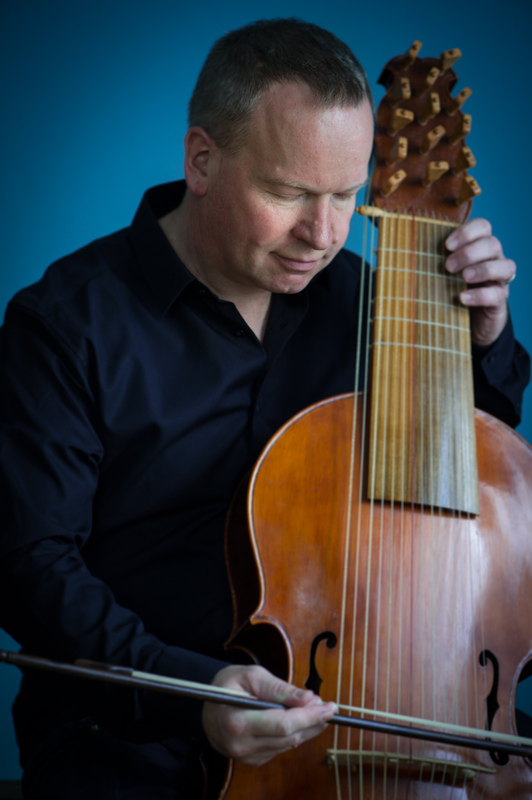 Michael Dollendorf sings the Evangelist part and accompanies himself on the Lirone, playing all the music usually done by four viols. Schütz had two extended stays in Northern Italy, first as a student of Giovanni Gabrieli in Venice and later traveling to recruite singers and instrumentalists for the Dresden court and also to buy sheet music and instruments. The German protestant was heavily influenced by the new oratorio performances. Well known composers of the period were first of all singers or virtuosos on various instruments. They embraced the new basso continuo style. Emilio de Cavallieri asks in his 1600 preface to the „Rappresentatione di Anima et di Corpo“ for two kinds of instruments to be involved: those who can hold chords (organ and lirone) and those who can give an impulse (lute, chittarrone, harpsichord). Giulio Caccini , Le Nuove Musice 1601, was a famous tenor who accompanied himself on lute and lira da gamba. Luzzano Luzzasci worked as a composer and teacher. He rehearsed the famous „Concerto delle donne“, the three singing ladies of Ferrara, from his harpsichord that had 19 or 31 keys per octave, so they learned their music in perfect intonation, while they accompanied themselves on harp, lute and viol. Claudio Monteverdi was working at the Mantuan court as a virtuoso viola bastarda player, long before he started to compose. In Renaissance Italy the idea of self-accompanied recitation was born. They thought that they had re-discovered the way how the ancient Greeks had performed their verse. Favorite instruments were lira da braccio and lira da gamba (lirone). Schütz takes this sound for the Evangelist in his 'Auferstehungshistorie' but scored it for strings, since there was not such an instrument in Saxony. Originally the 'Historia von der fröhlichen und siegreichen Auferstehung' was composed in 1623 for the Easter celebrations in Dresden. It was used as devotional music in the princely chamber, quite often several days in a row (like we play a new CD over and over 'till we know it by heart). It is very nice to hear this piece in a very intimate setting. It's not really for the big church. In the center of the performance is the Evangelist's narrative accompanied by a sustained string sound. The other parts can be sung by a vocal consort of 12 singers (4 Sopranos, 2 Altos, 4 Tenors, 2 Basses) accompanied by a little organ or a chitarrone. Following article about all the performance aspects of the 'Auferstehungshistorie' was held as a lecture and published in 2002. „Beiträgen zur musikalischen Quellenforschung, Band 5“, Heinrich-Schütz-Hauses, Bad Köstritz and reprinted in Mitteilungen Nr.49, Viola da Gamba Gesellschaft.